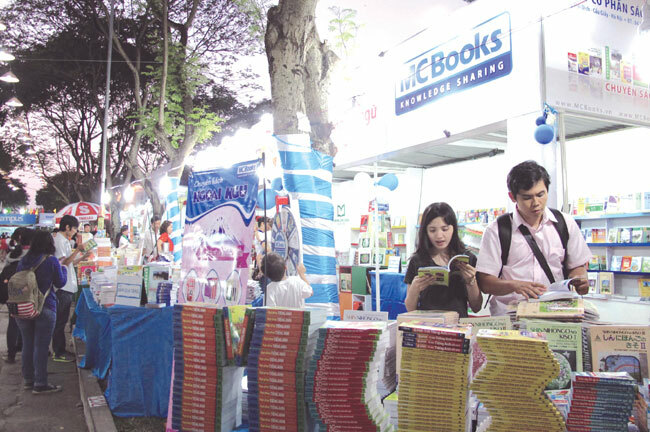 HCM CITY (VNS) — HCM City's eighth Book Fair themed Books – Culture and Development opened on Monday at Le Van Tam Park in District 1, attracting thousands of readers. This is the country's largest book fair and is now an official member of Viet Nam's festival circuit, according to Le Hoang, President of the Sai Gon Cultural Products Corporation. Hoang said that the festival attracted 10,000 visitors on the first day and although the festival didn't open until 8pm, people started arriving at 3pm to be the first through the gates. The festival is also an opportunity to discover and experience new electronic devices and applications for reading, and the book vending machine in particular seems to be of great interest to the visitors. In a bid to tempt visitors to buy e-books online, they are offering free wifi at the festival so readers can buy books online easily. The festival will be held across seven days, with around 160 local and foreign publishers, over 500 bookstalls showcasing over 200,000 titles and a range of activities. Books will be offered at a 10-20 per cent discount during the event and a further discount of up to 50 per cent will be on offer during the last three days to encourage reading among visitors. On the opening day, Hoa Nguc – Inferno by Dan Brown was the best-selling book, and was on sale for VND150,000 ($7.12), a discount of 20 per cent, according to a sales representative of the HCM City Books Distributors Joint-stock Company (FAHASA). In addition, there are over 60 activities, such as presentations by the authors, Q&As sessions between writers and readers, and reader competitions which will continue until the end of the festival on March 30.